Walking marathons is difficult. That's why we do them. But just because a marathon isn't a "walk in the park," that doesn't necessarily mean you'll be sore and wrecked for weeks afterwards. In fact, walking a marathon shouldn't leave you any more beat up or depleted than you were after your longest training walks. And it didn't take you a month to recover from them, did it? All of this assumes you do the right things before, during and after your event. But what are the "right things" that will speed your marathon recovery? The surest way to avoid the post-marathon blues is to train adequately for the distance you'll be covering. 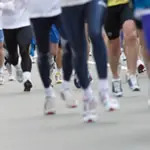 That means building up to at least a few 18- to 20-mile walks; the last of these no closer than two, but preferably three weeks before your marathon. If you only get up to 15 miles or so, chances are you'll finish the race, but you can probably expect to be sore or even injured afterwards. You really do need to get those long walks in to strengthen your joints and to teach your body to burn fat instead of carbohydrates during the marathon. Having said that, it's not necessary—or advisable—to walk longer than 20 miles in training. Some walkers figure that doing 23 or 24 miles in training will help them to build confidence. Maybe so, but every mile you walk over 20 in training increases your likelihood of injury and adds to your recovery time. Ultra-long training walks also are more likely to slow down your marathon pace than they are to improve it. Rest assured, if you can make it through 20 in training you'll make it through 26.2 just as easily in the race. In addition to building endurance and helping you to learn your marathon pace, 18- and 20-mile walks are where you'll teach yourself to eat and drink on the go. Much of the soreness you feel after a long event is due to dehydration and carbohydrate depletion. So you'll have to get your stomach used to taking in about 8 ounces of fluid every 15 minutes (on average), as well as getting your gut used to tolerating sports drinks or Power Gels to avoid carbohydrate depletion. What you do during the race has a great deal to do with how you'll feel afterwards. Smart pacing is not just a way to ensure a fast marathon time, it's also one of the keys to quick post-marathon recovery. Starting out too fast prompts your body to burn a high percentage of carbohydrates during the race. If that happens you'll become carbohydrate-depleted toward the end of the race and you'll "hit the wall." Your muscles will become very inefficient at burning fat as a fuel. No carbohydrates and no fats leaves only one fuel source: protein. If you hit the wall and keep walking you'll actually start breaking down muscle tissue to use as a fuel source. It's certainly not fatal, and you'll eventually recover, but you'll feel beat up for weeks after the marathon rather than days. Luckily, the wall is easily avoidable for marathon walkers. All you need to do is start out at a reasonable pace and you'll set your muscles up to burn fat rather than carbohydrates. After 10 or 12 miles, if you're feeling really good, you can pick up the pace a bit. If you've started at the right pace you should be able to pick it up even more over the final five or 10 kilometers. Your overall time will be much faster than it would be had you started out fast and "crashed," and your recovery after the race will be much faster. Taking in those 8 ounces of fluid every 15 minutes and drinking or eating carbohydrates after the first 90 minutes or so into the race are also good ways to ensure a fast marathon recovery. Staving off dehydration, and supplementing your carbohydrate stores will keep your muscles working efficiently, ensuring that you'll be burning fats and carbohydrates instead of muscle protein in the late stages of the race.